The Year Ahead – Cautious Optimism! First off, it’s been a while since I have had blogged about anything fishy but I decided to take a little break after a fairly hectic end to the 2016 season. I didn’t do a whole lot over the closed season except tie a few flies including some intruder style flies for my pal Ned for his trips to Canada. One of these years I will join up with them as the whole experience seems mega. September 2016 was a bit of a scramble with the river trout and salmon seasons coming to an end combined with some fantastic bass fishing tides! 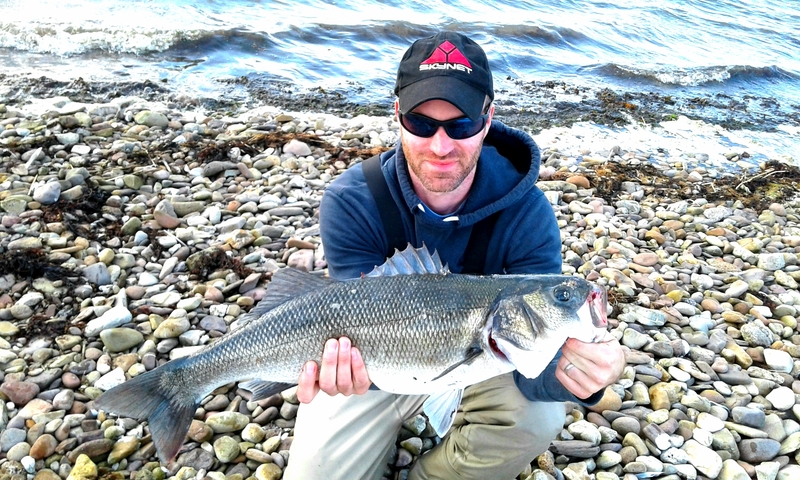 The weather was good and the bass fishing continued to provide decent sport right through November. 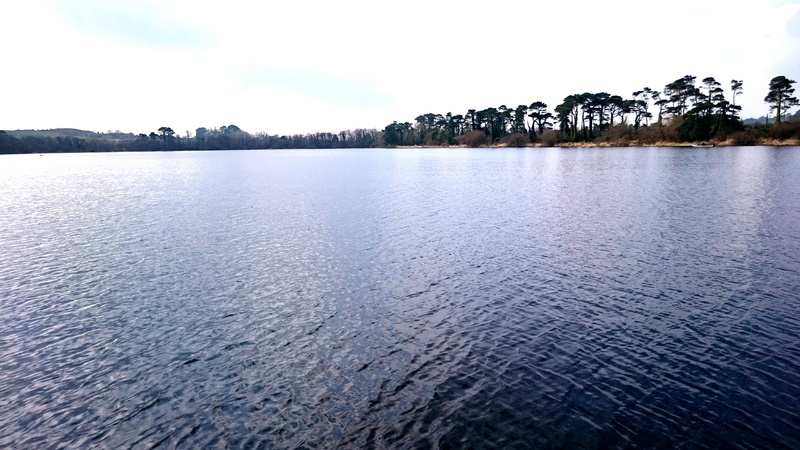 I didn’t do anything like as much winter reservoir fishing as I have done in previous seasons and 2017 kind of crept up on me and before I knew it I was off to Dublin for the Ireland Angling Expo in February. This is always a great event and this year was no exception although if anything there was more for the predator (bass/pike) angler to see than some previous years. 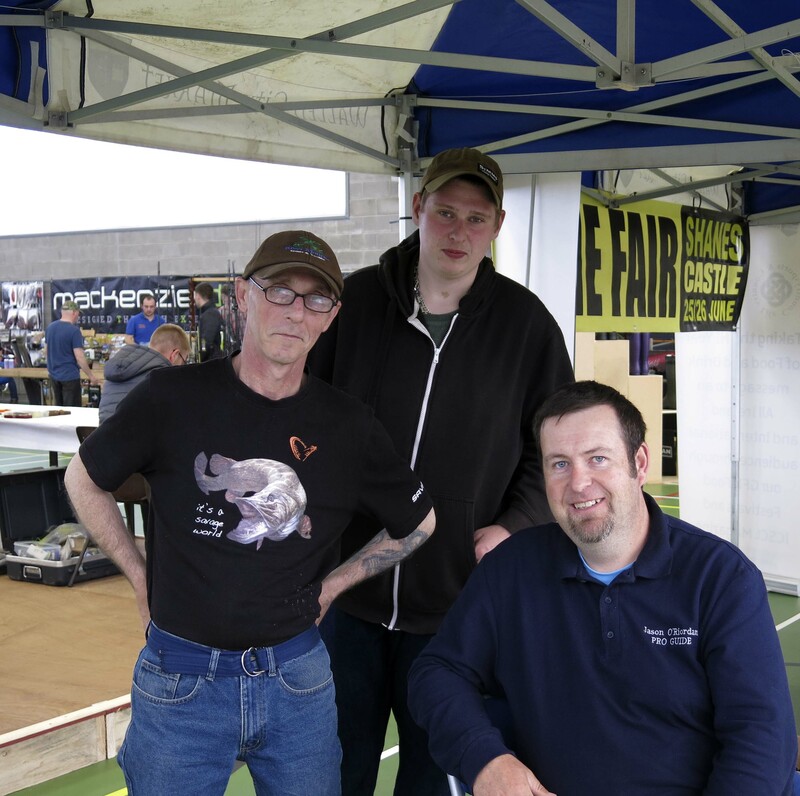 There was still a lot there for the trout and salmon angler too with top brands like Simms, Redington, Mackenzie, Airflo, Nautilus, Hardy/Greys etc etc all on display. The attendance at my talks each day was brilliant and as always it was epic to meet up with the Mackenzie Pros and all of the various people who make the show tick in one way or another. I always say this show is much much more than just tackle sales. March is now upon us and things are already starting to get busy. I have been out giving tuition and guiding and later this month I have two stillwater courses running, a Match the Hatch course in Wicklow with Ken Whelan and a Stillwater Tactics course at Ardaire Springs in Mooncoin. In the meantime I am putting a lot of effort into testing the absolutely awesome prototype for the new 10ft 6wt Mackenzie FX1 Graphene single handed rod. So far the results have been superb. 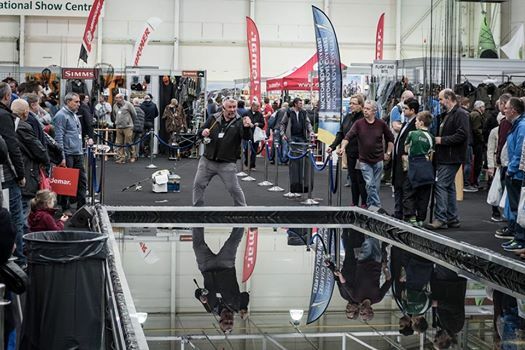 It casts really well and everyone who tried it at the show in Dublin gave great feedback. Trials have indicated that this will be a great buzzer/nymph rod that can also be used for some dry fly and small lure fishing if needs be. I am enjoying the testing so much with this weapon that it will take another while before Scott will be getting it back!!!! So everything is looking great so far for 2017. While some salmon rivers in Ireland had a disastrous start the Munster Blackwater seems to be performing quite well. 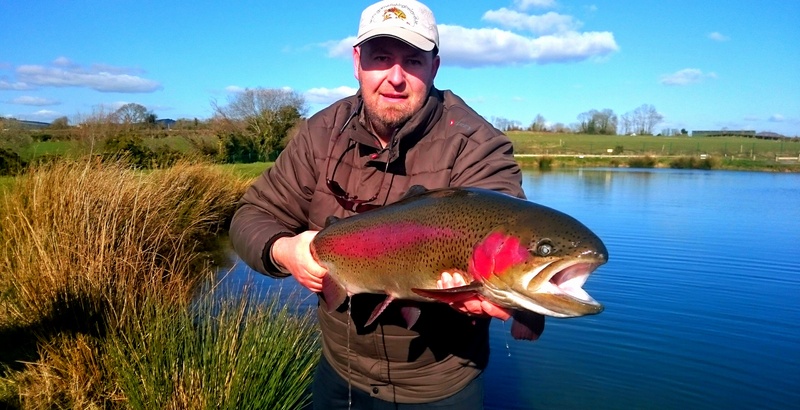 The quality of trout in Ardaire and the Waterford Reservoirs is excellent. 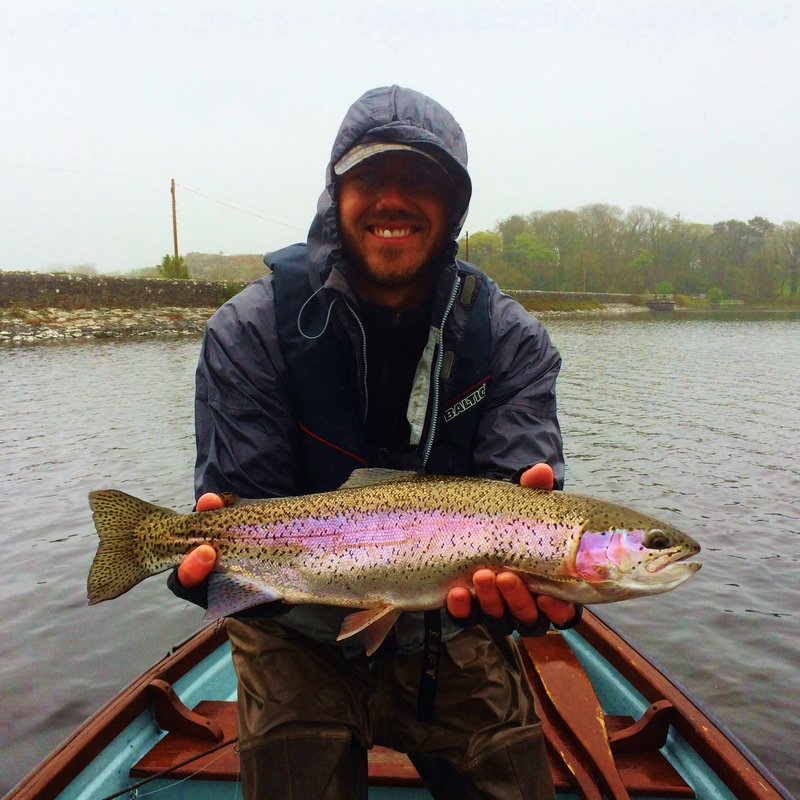 Initial reports on the river trout fishing in the Blackwater and surrounding rivers that are already open suggest that fish are in excellent condition. 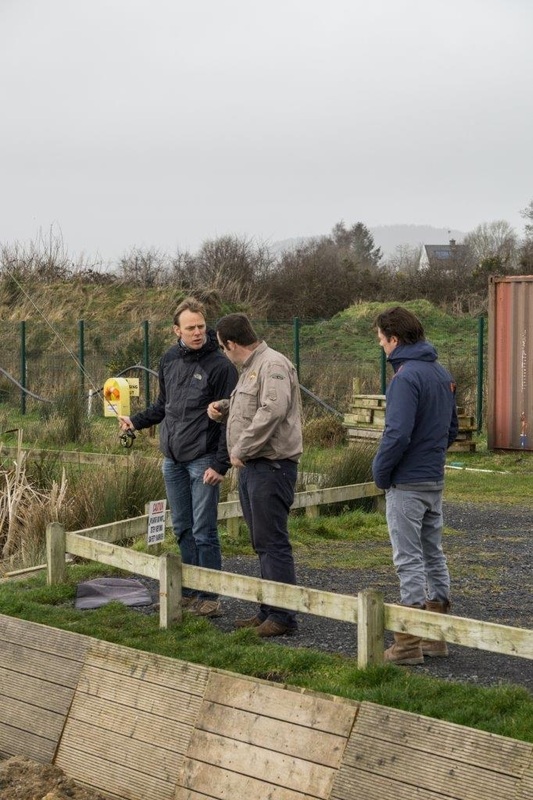 With lots more courses running during the year including our new Saltwater Fishing Course in June and the North West Angling Fair in Strabane in April not too far away it is difficult not to be positive. However, in spite of this optimism it is still early in the year to get carried away as to what the salmon season here will produce. The same can be said as regards sea bass. It will be interesting to see the effect of current conservation measures over a long period of time. Many rivers in Ireland are now classed as ‘closed’. This seems to be causing great confusion as to whether an angler can still fish them for brown trout and indeed sea trout under 40cm. Factor in the complete confusion as to what the rules are about fishing for sea trout in saltwater and you have something of a Gordian Knot. More on this to follow in my next blog (not to be missed)!!!! 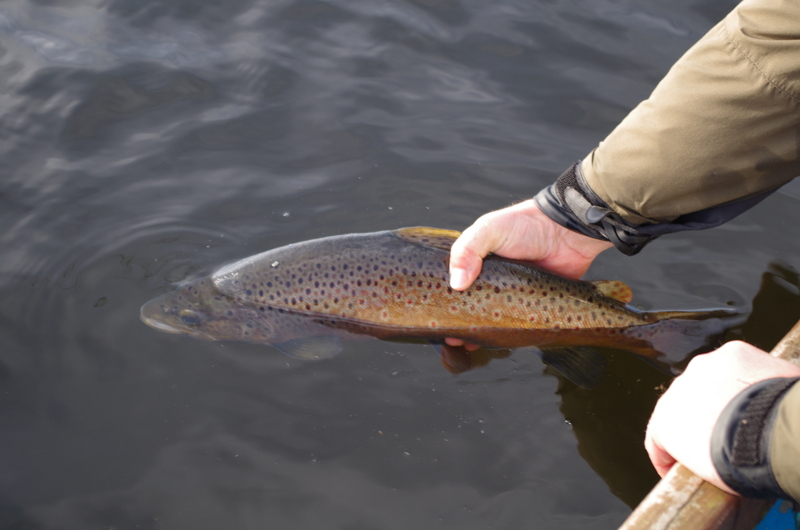 APPS-solutely Bloody Squirmy-ish – Winter Stillwater Tactics! Finally, after an unprecedented spell of mild and rainy weather we are starting to see temperatures drop. 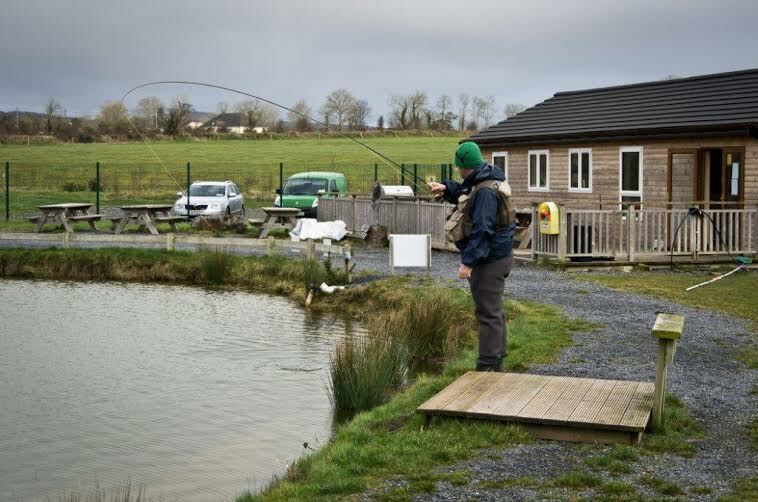 At this time of year most of our angling opportunities are going to be at stocked stillwater fisheries, like Ardaire Springs in Mooncoin. If it is really cold then a spot of bank fishing is on the cards. Walking around on the bank keeps the body from freezing! So what about tactics for these venues in cold weather. 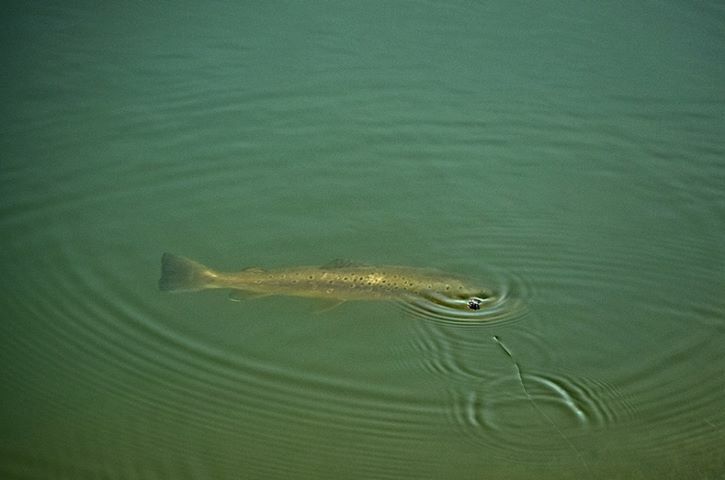 Of course there is always the chance of a few fish rising and fishing dries or subsurface but the window of opportunity tends to be very small when the water is cold and the fish are lethargic. Moreover, natural food items can be scarce and those that are around will also have slowed down in their movements. 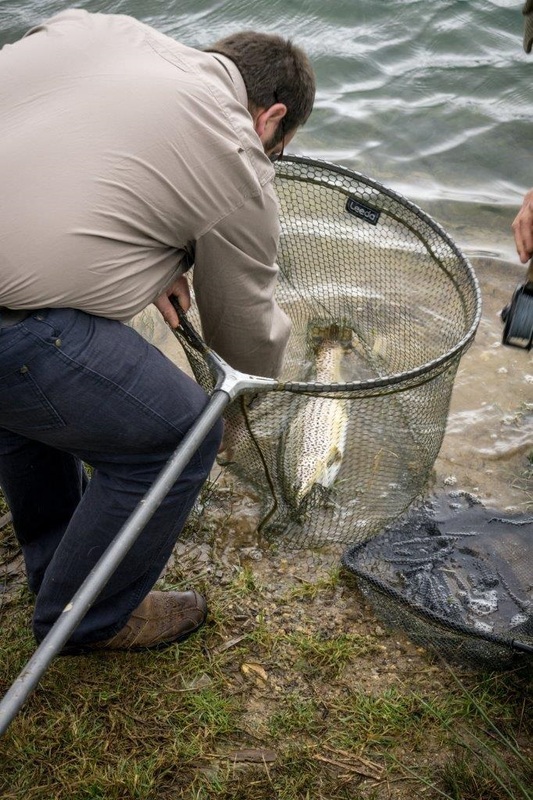 Stripping lures back at speed might trigger a response, particularly if there are some sticklebacks in the the margins but is it going to be realistic and very productive to the trout – probably not. You could inch back boobies of course, but that’s a tactic for another blog! 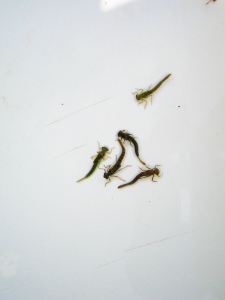 One food item that is definitely going to be on the menu at this time of year is the bloodworm or midge larva. These guys are drifting around near the bed of the lake not moving a whole lot and trout love them. BUT remember they move really slowly, even when they ascend in the spring as what we anglers call Buzzers, they still move really slowly. So you have to fish them really really slowly or static. I think you might be getting the really slowly bit at this stage!! As far as equipment goes something like a 9ft6 6wt would be good. A full floating line and a long leader. You could fish two flies but on some of these waters where trout are well into double figures I usually fish a single fly. A typical approach is to cast out the bloodworm imitation and retrieve it back with a really slow figure of eight. Just keep the slack out of the line and keep in touch with your fly. When fishing like this I like to fish into the wind if it is not too strong. Firstly, lot of food can be blown into one corner of a small stillwater with the breeze and secondly, as you are retrieving at the same speed as the line is drifting towards you the imitation looks more natural. If you think about it ,when you are casting with the wind behind you and retrieving the imitation against the wind it is moving in the opposite direction to the natural food items. 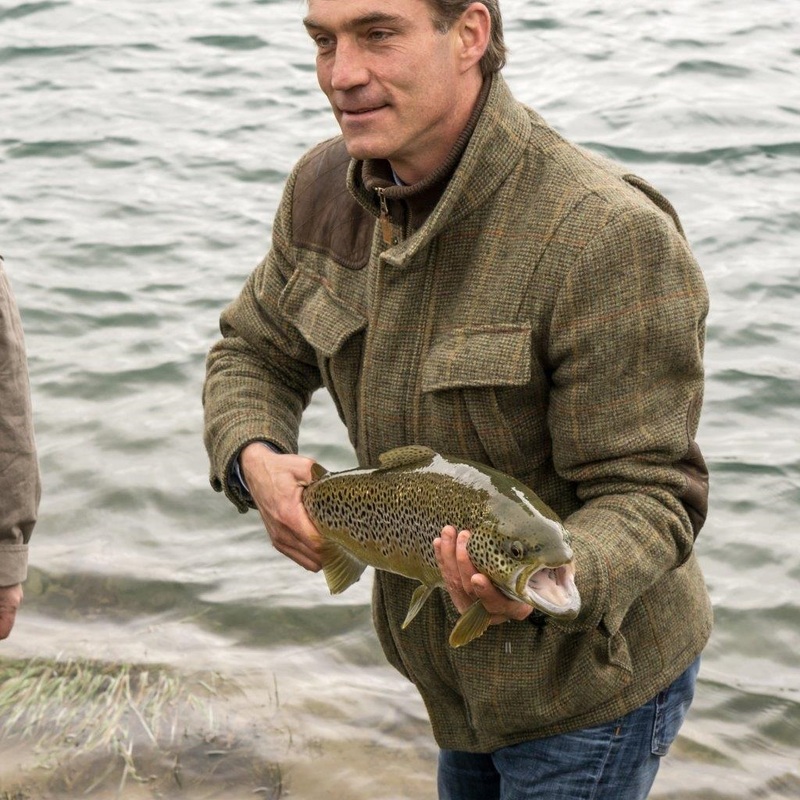 Will this fool a wary trout that has been caught and released several times before? So what do bloodworm imitations look like. Well they could be just red buzzers really, often tied on curved hooks. These are good but they lack any subtle movement when they are drifting. One option is to add a red marabou tail that will move underwater as the fly is retrieved. 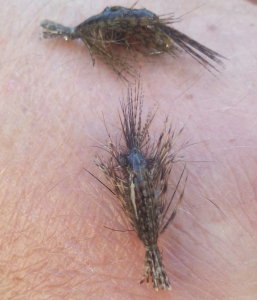 A very popular fly is the Apps Worm. 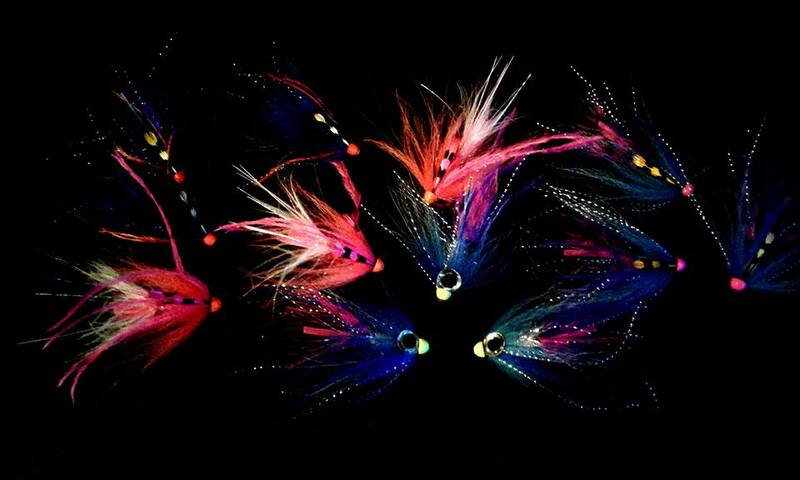 This fly makes use of long strands of elastic material that adds movement in the water. When you look at it first an Apps Worm looks like something scary with long red ‘legs’ protruding front and back. However it is when the fly is wet and the elastic strands stick together that the fly really looks like a worm. There are many variations of this fly with some having more ‘legs’ than others. The one I prefer is with two strands front and back. 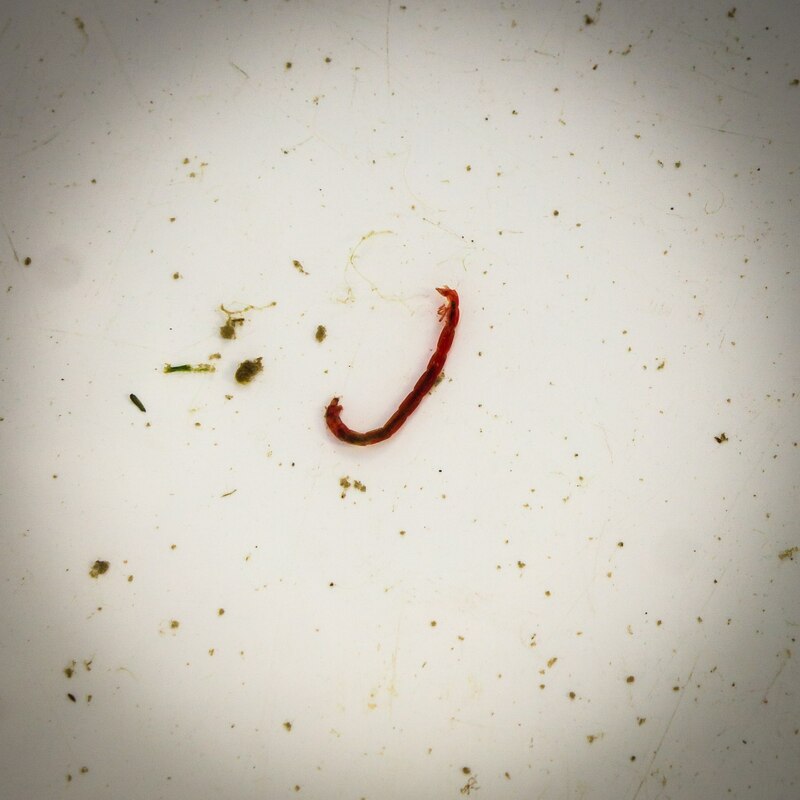 The natural bloodworm has distinct segments (as in the photo above) and a great version of the Apps Worm uses red glass beads along the body. These also add translucency. A great tip I was given by an international competition angler was to tie this one on a gold hook as it adds greatly to visual effect of the fly. Us anglers are always looking for an edge and in recent times another fly (if we can call it that) that has really taken off is the squirmy worm. This worm fly uses a really soft stretchy material that moves unbelievably in the water even when the fly is fished static. The material can break easily so make sure you have plenty spare flies. 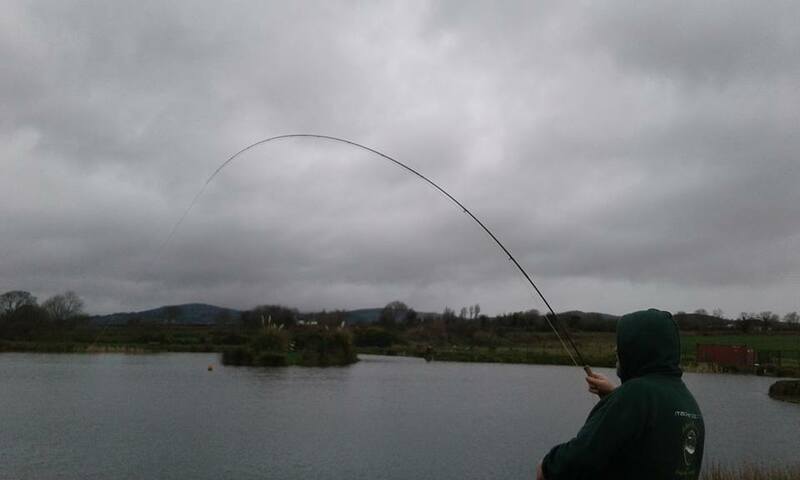 If you are new to this type of fishing then the way to fish a worm static is under an indicator (unless these are not allowed at the fishery). 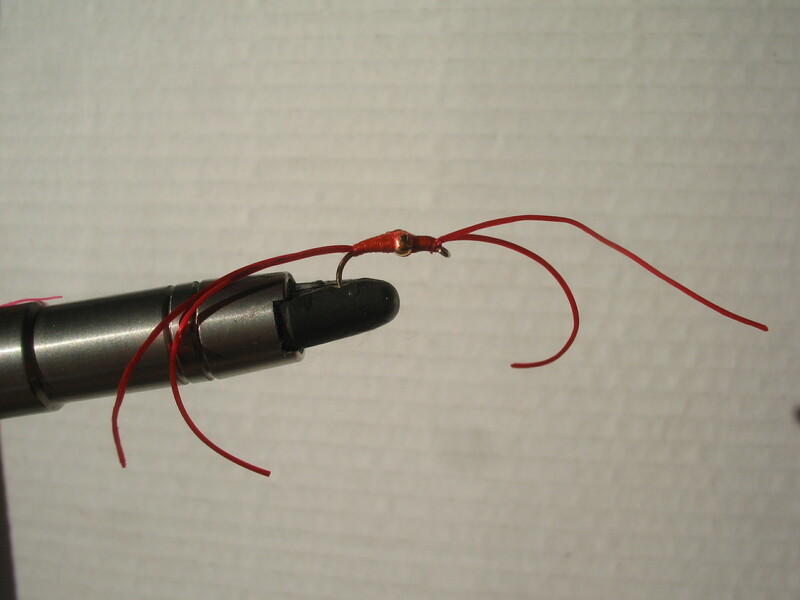 Indicators are a massive help in bite detection.There are many types of indicators including the very controversial ‘bung’. What’s a bung? Well to keep things simple it’s a very large and visible indicator that can support heavy flies, including lures. Earlier this year an angler was fishing a bung when practicing for a bank competition and from the distance I thought his hat had blown onto the water!! You don’t really need anything that big to support the weight of an apps worm or size 12 beaded squirmy worm. I use a colorful foam indicator that I make myself from some booby cord glued onto a size 10 blob hook. It’s easy – cut the foam to length, spit it with a scalpel and glue it to the hook shank! You can cut the hook at the bend afterwards. 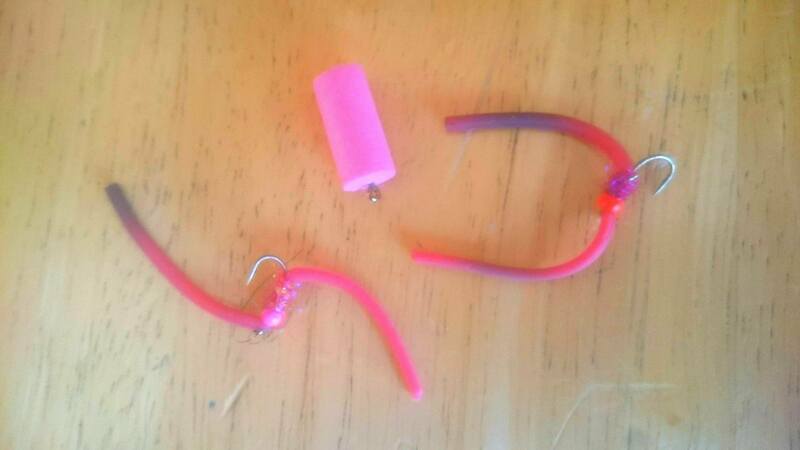 I slide it up the leader before I tie on the worm fly and I keep it fixed between two power gum stop knots. If I want to change the depth the worm is fishing at I just move the stop knots. Worm fishing is not for everyone. It requires a lot of patience to fish the flies slowly enough. Some anglers I know won’t fish them (they think it’s like coarse fishing! ), but there are days when they considerably out-fish everything else. Other guys I have fished with will fish them but they won’t use an indicator. This is sometimes because they are so confident in their abilities that they believe they won’t miss any takes! 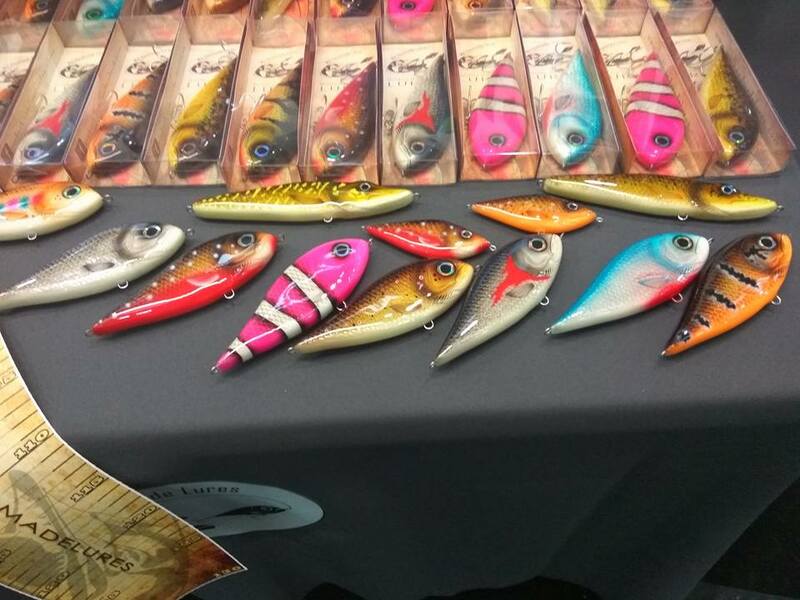 For others, they won’t use indicators because they feel there is a stigma attached to fishing with them (especially because of anglers using big bungs). The only comment I will make is “each to their own” and there is no denying that worms work, especially when fished static. On many of our stillwaters at this time of year the fish are well acclimatized residents used to natural feeding and the water temperature is dropping steadily. In other words the fishing often gets that bit tougher. 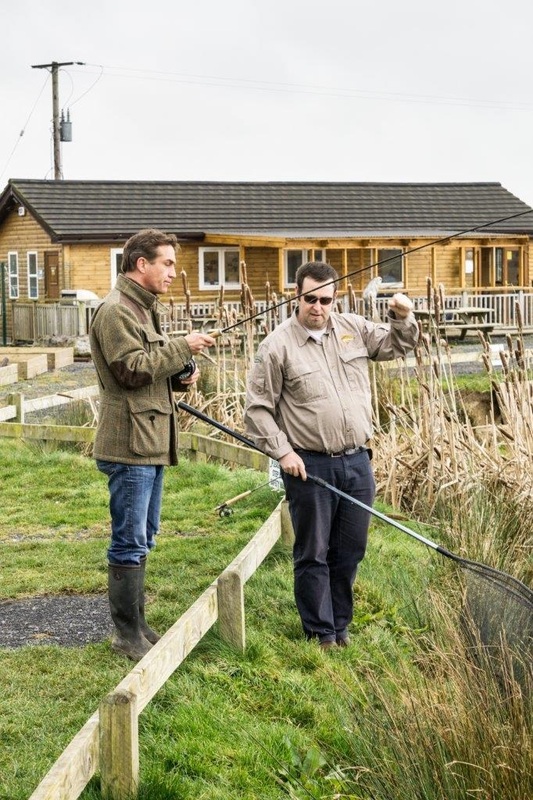 In recent weeks I have noticed rod catches dropping on our local reservoirs even though fishing continues to be good and the quality of trout is excellent. are they using the wrong flies/not matching what the fish are feeding on? are they concentrating on the wrong areas? are they presenting the right flies at the wrong depth or speed? 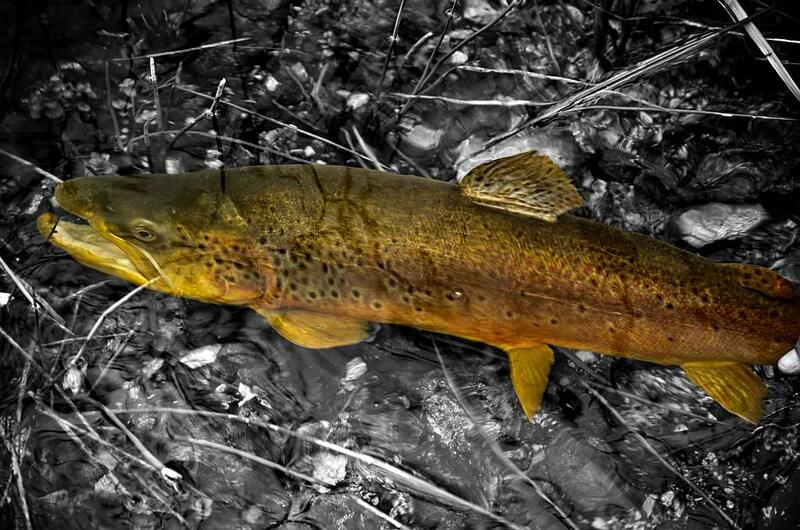 To my mind most anglers now know the various food sources fish are likely to feeding on at various times of year. They also have a good grasp of where the fish are in their local lake. That just leaves the third possibility – they are not presenting their flies correctly. 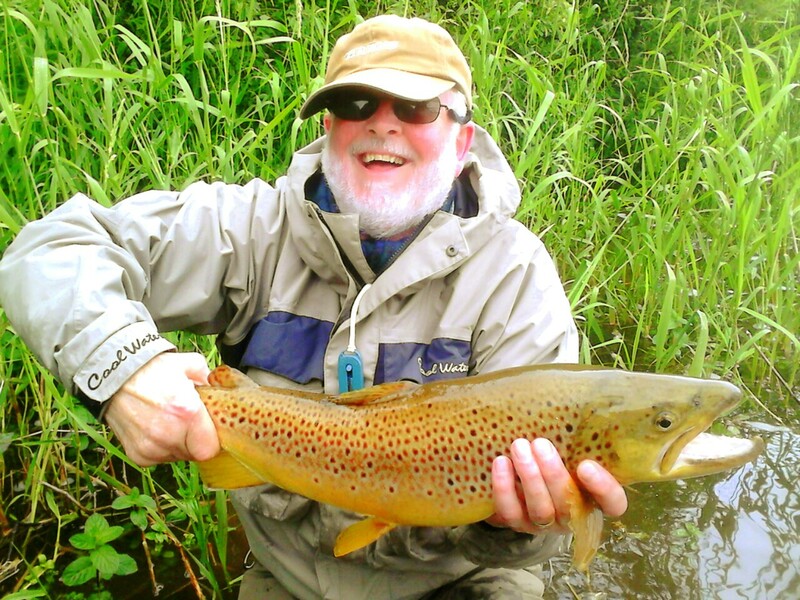 Quite often when I am guiding beginners they think that presentation is only important for dry fly fishing – MISTAKE, BIG MISTAKE! Presentation is ALWAYS important. To cut to the chase, as the water temperature drops and hatches slow down fish are more likely to be feeding deeper in the water on slow moving creatures, e.g. shrimp, hoglouse, snails. This all seems fairly obvious but time and time again I see anglers ripping back every fly (buzzer, nymph, shrimp, etc) just as if it was a wet fly or lure. Even when I say “slow down the retrieve” it often only goes from super fast to very fast! So concentrate on your retrieve, try to incorporate slow short pulls, lots of pauses and of course the lethal slow figure of eight or static retrieve (just keep in touch with the flies as they drift). Remember – it’s all in the hands! Enjoy your winter fishing. The other day I was guiding Kyle from the USA. We were planning on a days salmon fishing but due to all the recent rain the river was out so we switched to plan B – lake trout on the Waterford Reservoirs. The forecast was simply dreadful. Strong north east winds and persistent heavy rain. However, I was undeterred as after years of experience I knew we would have shelter from the wind in Knockaderry lake and there had been a good buzzer hatch there lately. So off we went in search of some hard fighting trout. 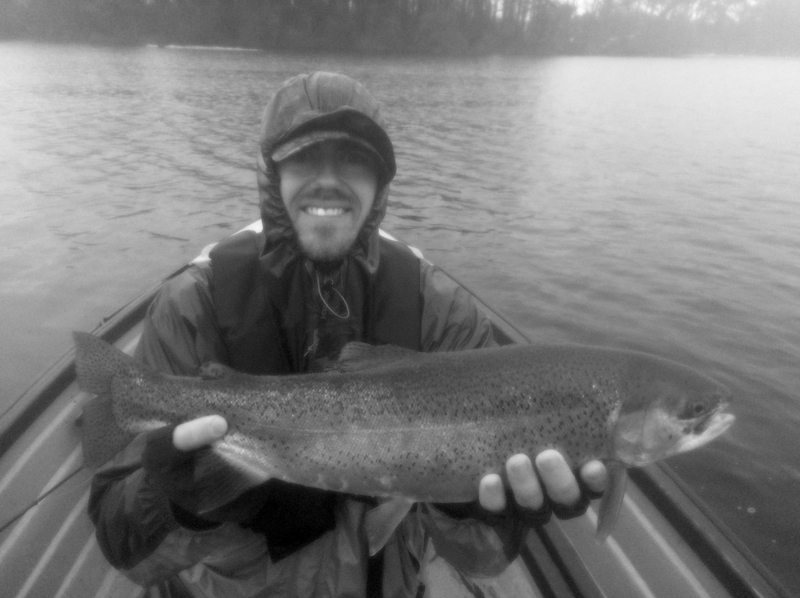 Despite the weather we had a good start with Kyle nailing a decent rainbow early on. 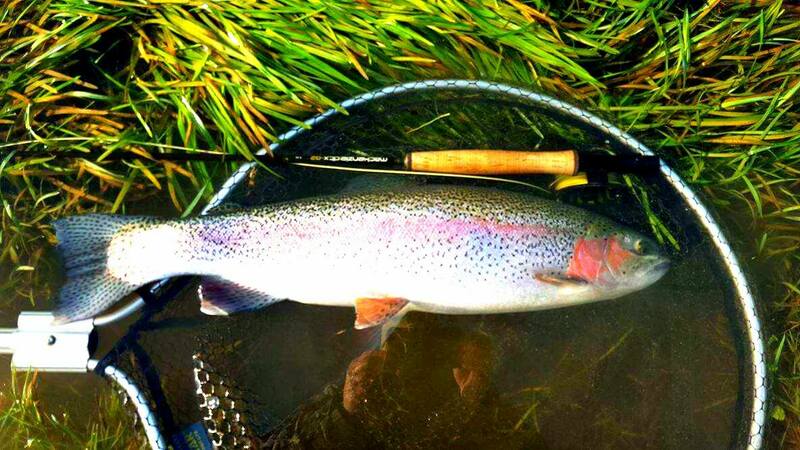 The fight from that rainbow was exceptional, even on the powerful 10ft 7wt Mackenzie rod. 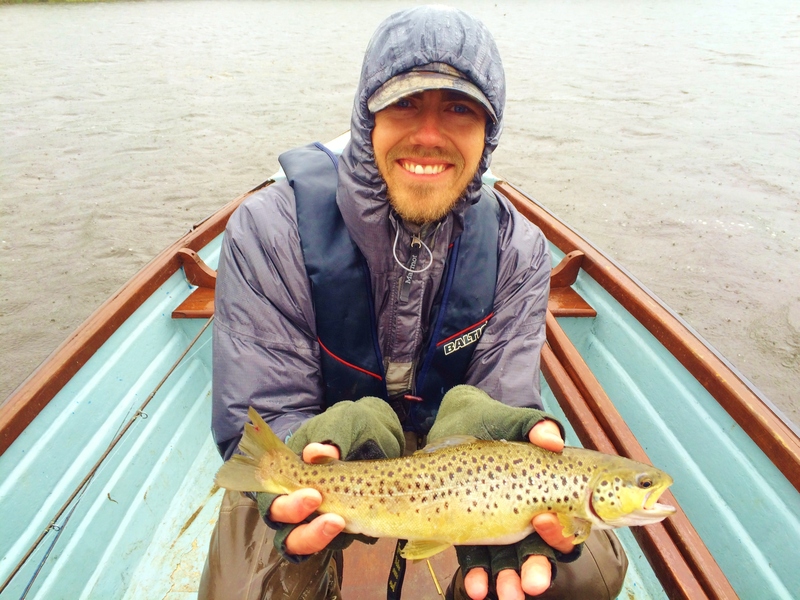 It was nice to hear Kyle comment on the fantastic quality of the trout as he has fished in many places. Next on the list was to try catch a brown and the one Kyle caught was a lovely fully finned fish too. We searched around the lake and had some more really good rainbows. The rain was so bad at times that it made taking good photos out of the question but I just had to get a shot of this belter. Kyle finished his day having caught and released eight trout, although not all of them were monsters. 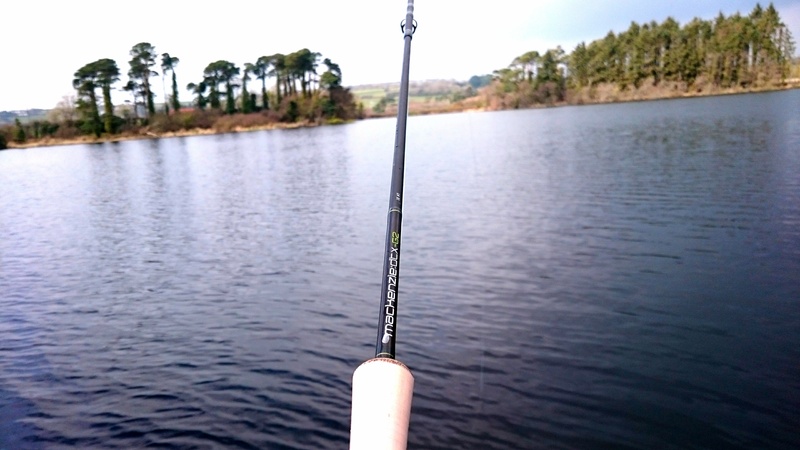 I finally got around to fishing Knockaderry for the first time on St Patrick’s morning. 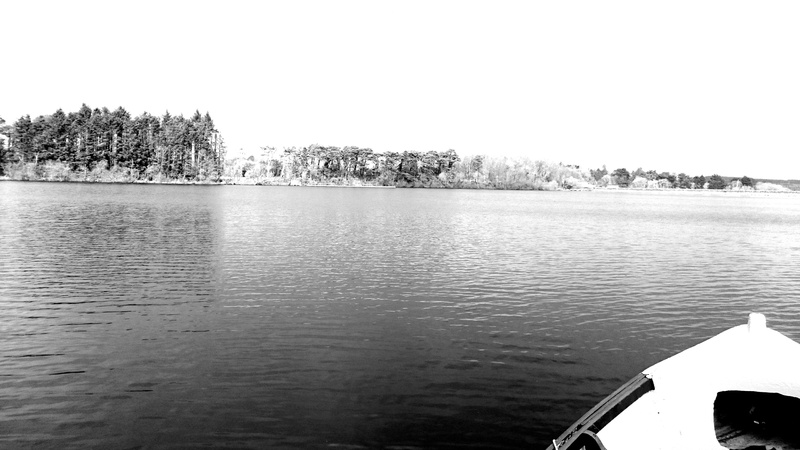 This lake is one of my favourite fisheries and I was really looking forward to wetting a line there. The day itself started out cool but the day got warmer and by mid morning there was a great midge hatch. The sun shone and the breeze was gentle giving a lovely slow drift, ideal for buzzer fishing. By lunchtime my car was covered in small midge. 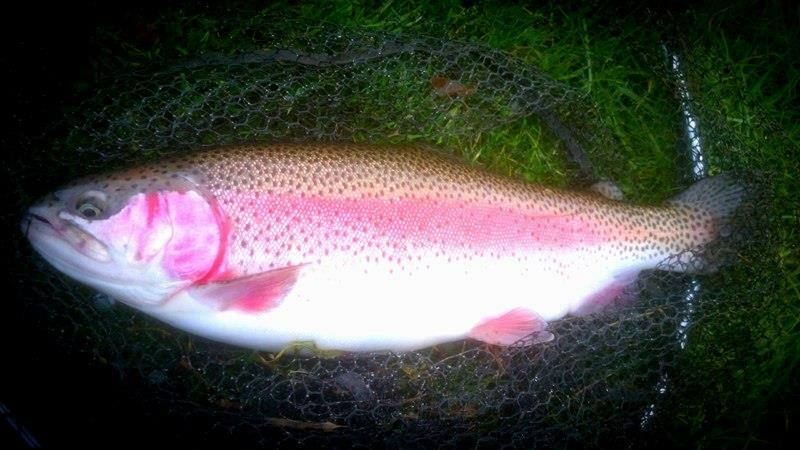 The big hatch really got the large rainbows moving and quite a number were rising and feeding on natural fly. Fishing small buzzers through the layers was the effective tactic. 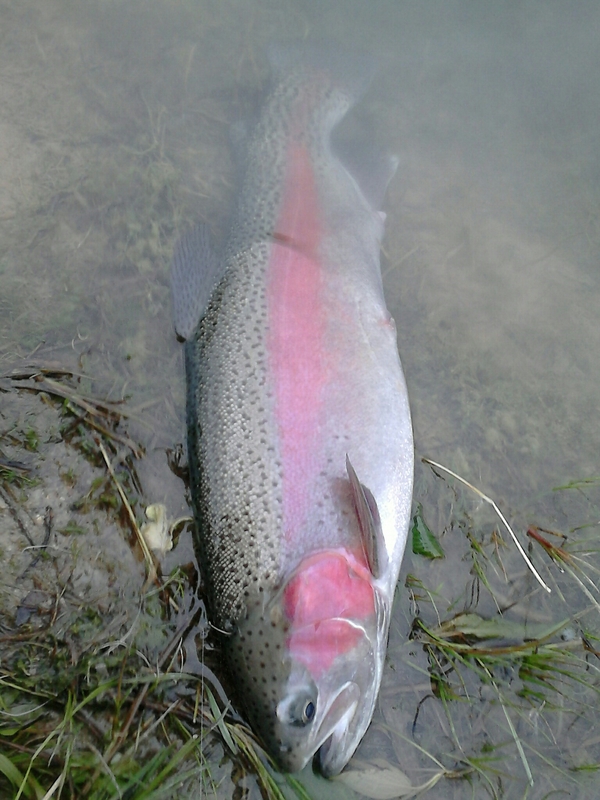 There are some serious trout in this lake and the average size of the rainbows was 5 to 6lbs. These fish will take you to the backing and I was glad I decided to fish with a 10ft 7wt and not a lighter outfit. Ned Maher told me that Ardaire Springs also enjoyed a bumper day with the rise in temperatures. The last time I called over there I managed a fantastic 18lbs rainbow. 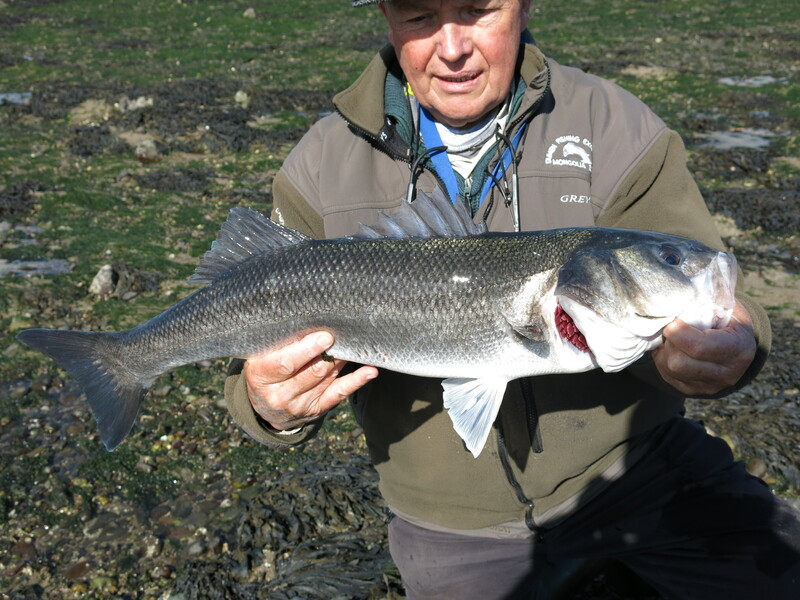 Looks like we are spoiled for choice for quality stocked fisheries here in the south east at the moment! Fished Ardaire Springs yesterday with three Dutch anglers who were new to stillwater trout fishing. Two of the guys were visiting their friend who lives locally and had never fly fished before. 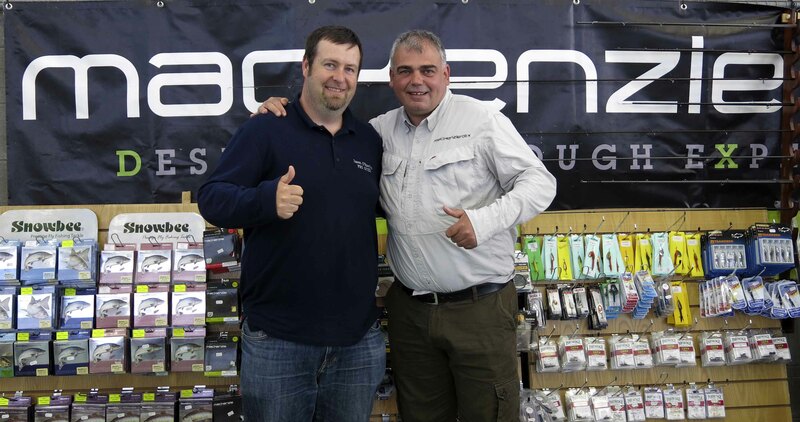 We arrived at Ardaire around 11.30am but Ned was expecting us and had three Mackenzie single handed demo rods ready and waiting for the guys. There were a lot of anglers fishing the lake but I noticed a few spots available outside the fishing lodge. The guys were keen to make a start so I got them all casting with different fishing methods and before I could pop back out to the car to put on my wellies Pieter was into a good fish. 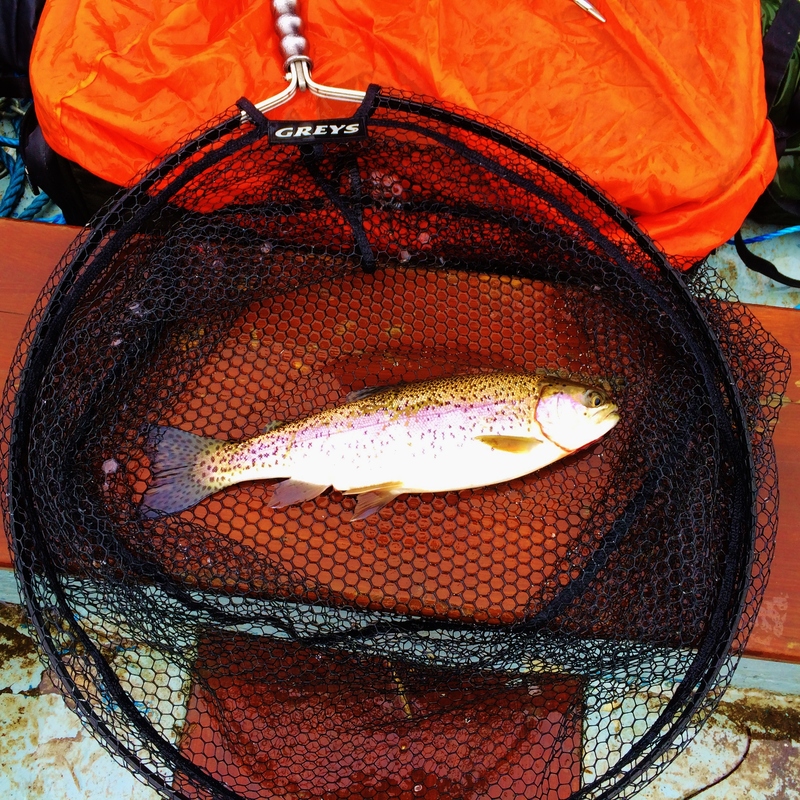 It turned out to be a cracking brown trout. What a start! A beautiful fish with a lovely golden hue to it. The weather started to deteriorate with the wind getting stronger and rain looked imminent. 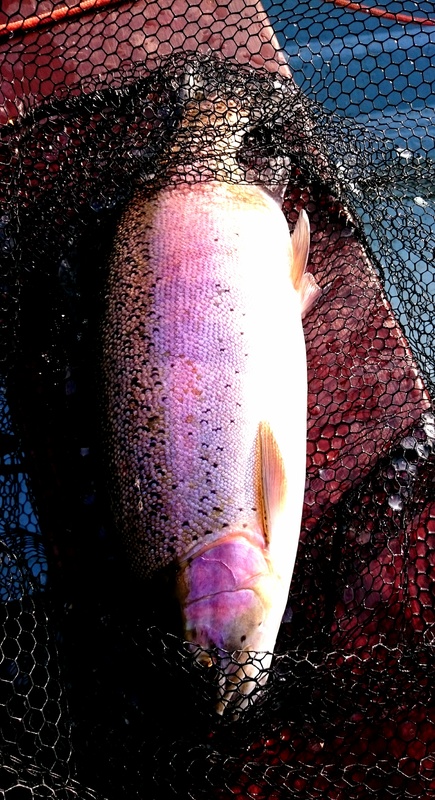 Nevertheless the guys fished on and landed some nice rainbow trout on dries. 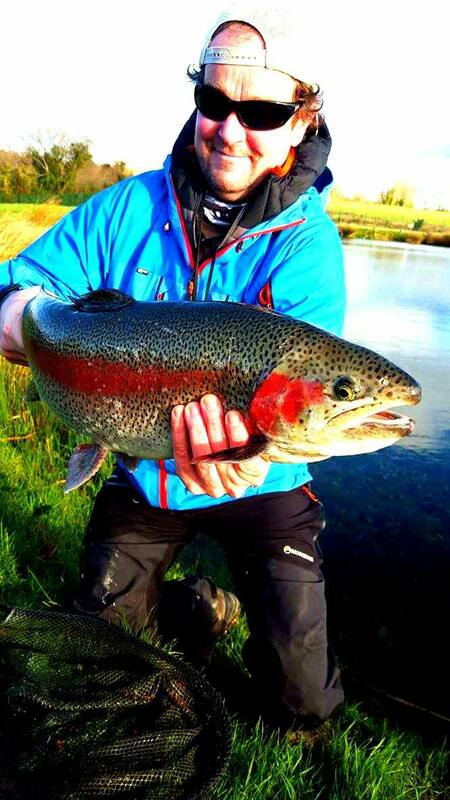 Local angler Adriano managed to land a 14lb rainbow on a lure while we were there. The wind got really strong but even so the lads were casting well. Eventually the weather got very wet and cold so the guys decided to call it a day. 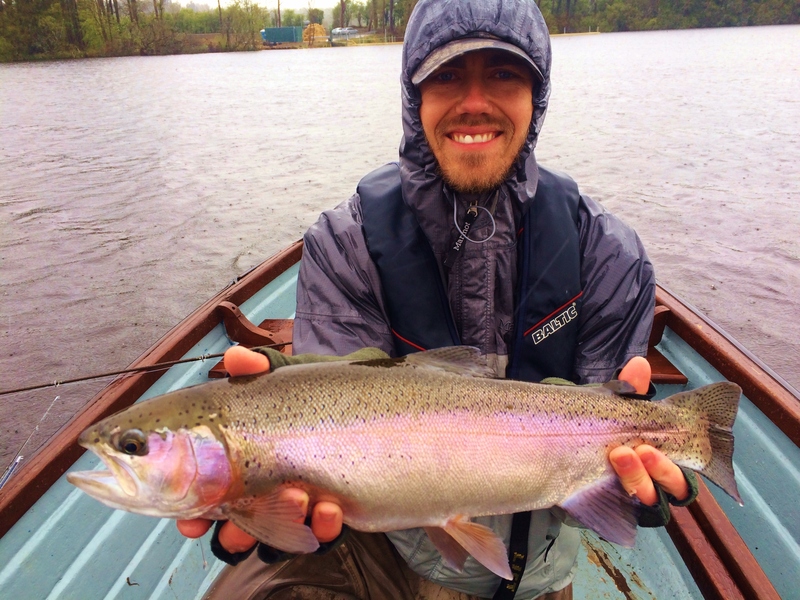 I heard that another big rainbow approaching 20lbs was landed afterwards. Overall it was a good day and I managed to get 10minutes casting in with the Mackenzie 7/8 Switch rod and Compact Switch line. What an awesome piece of kit! I left it on the rod rack and a few of the other anglers had a cast with it. Ned told me afterwards that they were really really impressed with it. No surprise there though.